Pondmaster Deep Water air pumps are perfect for a variety of water related applications for your pond and aquarium. Helps aerate your water and maintain a healthy living environment to ensure your aquatic life receives the proper oxygenation needed. Suitable for use in freezing temperatures as long as the air pump itself is not exposed to freezing temperatures - locate in the garage above freezing. NOTE: Tubing is sold seperately! 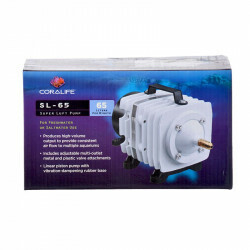 We purchased this air pump for an in-home 2500 gallon koi pond. It is great at pumping air...the fish are happier and there is definite improvement in water clarity. However, this thing makes so much noise! It is dreadful! Currently we have it sitting on egg crate foam in an attempt to muffle the constant drone. We tried putting it in a box - no good...the box vibrated. It must have access to air circulation as it produces heat from the motor, so I am not sure what else to do other than wear earplugs. Seriously. Powerful pump, all the air I want for 4000 gallons. Not much, if any, louder than small aquarium pumps. Only used a short time, so no knowledge on longevity. I'm really happy with this product! However, it stated on the instruction manual that there was tubing included and there was not. If I had known this prior I would have ordered tubing. I've been keeping koi for almost 10 years and used all different air pumps. 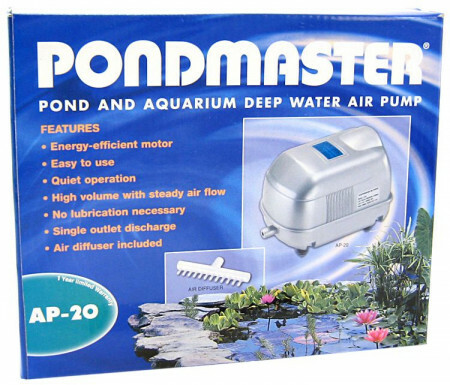 This Pondmaster Air Pump by far is the best of them all. It is strong but quiet, and more importantly very reliable. Hence, I don't look for anything else other than this air pump. I have an 8,000 gallon pond and I run a pond master 60 and a 40. I have had them running for 4 years daily and they are still running strong. My japanese koi are very healthy thanks to highly oxygenated water thanks to these great pumps!! 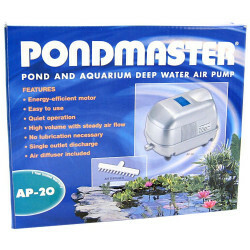 I have 2 of these pumps, an AP-40, and an AP-60, which I have been using in my Koi pond for over a year. These are such an improvement over the pumps I have used previously, I can't believe it. I highly recomend these pumps for their performance and reliability. Silent, efficient, compact. Just what I needed for my aquaponic airlift. Thanks, would order again if needed! Just installed the AP100 in our 150'X200'X8' pond. It shoots up bubbles from the bottom to about six to eight inches above the surface and sends waves across the entire pond. We are very pleased with the performance. I have a set up with 12 tanks, and had been running 6 diaphragm pumps on it. Bought this piston style pond pump and replaced those 6 air pumps. Now I have 3 times more air, and more efficient. A great pump in my opinion. I needed a air pump that was quiet and could carry several sponge filters in my aquariums. The AP 60 was recommended but I chose the AP 100 because I was planning on adding more tanks later on. I can tell you this AP100 is doing an outstanding job with plenty of air to spare. I have 18 aquariums running on it right now and I'm still bleeding air off so I know I could still double the aquariums with air to spare....GREAT PUMP. After a lot of online and in-store shopping I determined this item and vendor to be my most cost-effective solution. The product arrived a day or two earlier than expected and met my expectation with respect to quality and performance. It was easy to install and is working just fine. I had a great first-time experience with both product and vendor. Product is just as indicated..It is GREAT, works wonderfully. Price was also Great. Thank you. This is very quiet. Set up easily and is working fine so far! So far, after a week, it is working as expected. I was surprised at the amount of noise it makes, but mine is outside (at a pond) and the noise is not an issue. Also, the hose I am using is 5/8" ID. The 1/2 inch hose would have to be soft and stretch a lot to fit on the barb. After I week, I am pleased. My wholesale distributor was out of them, and your price was the best. You seem to carry the products I recommend, so you will likely here from me again. 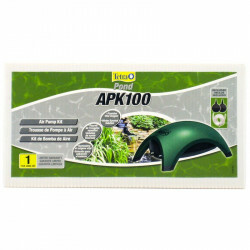 I have been using the aquarium air pumps in my pond, but after the 3rd one died I decided to try the AP-60. 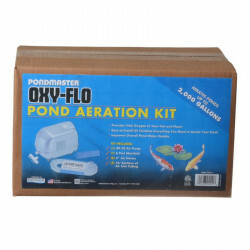 It works great and really circulates the water, and the fish seem happier. Easy setup and works better than expected.